High Fructose Corn Syrup: What is the carbohydrate breakdown (amount of sugar, starch, and fiber) of Raw Agave (not agave nectar)? 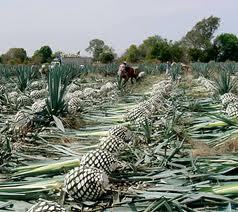 What is the carbohydrate breakdown (amount of sugar, starch, and fiber) of Raw Agave (not agave nectar)? Falsely labeled, agave fructose and high fructose corn syrup are both products of advanced chemistry and extensive food processing technology. There are several sources on the internet that show inaccurate breakdowns of sugar, starch and fiber that do not add up to the total amount of carbohydrates. An example of an inaccurate source is: http://www.nutritiondata.com/facts/ethnic-foods/10007/2. The starch + sugar + fiber = 2.6g but the total carbohydrates are listed as 4.5g. Please help!